Yay Summer is finally here. Long may the sun shine and any necessary rain fall at night! 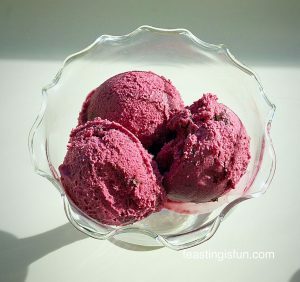 I’m loving using my new Which Best Buy Andrew James Ice Cream Maker to create as many different flavoured ice creams as I can think of. There are lots of them. This Chocolate Orange Ice Cream is my son’s idea of food heaven. Chocolate Orange Ice Cream bursting with flavour. 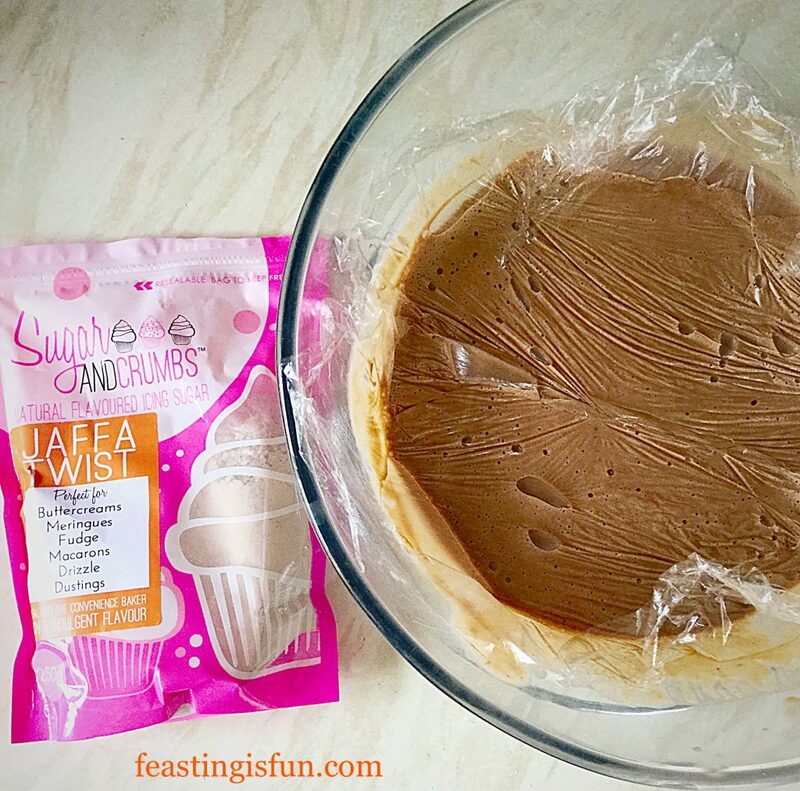 Our not so little man, more teenage strapping lad, adores Jaffa Cakes, so when Sugar and Crumbs sent me some of their Jaffa Twist Icing Powder with an order I’d placed I knew exactly what I was going to make with it. Can you imagine how great it felt to have my son hug me and say “Mum this ice cream tastes just like Jaffa Cakes”? He had absolutely no idea what ingredients I’d used, which is rare as he loves being in the kitchen cooking alongside me. So 10 out of 10 for Sugar and Crumbs in the flavour department. 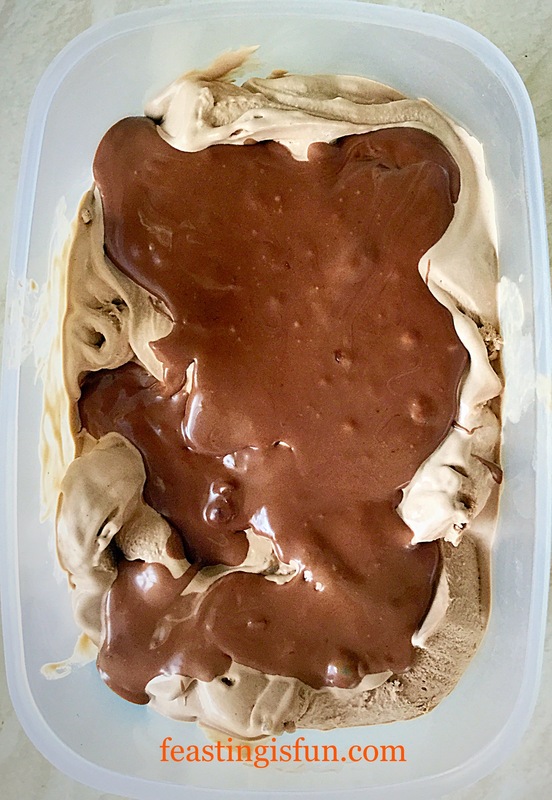 I also used a Lindt Intense Orange Chocolate Bar to create a chocolate ganache ripple that runs through the Chocolate Orange Ice Cream. Making the chocolate orange custard was simple, I simply switched the caster sugar for Jaffa Twist Icing Sugar. 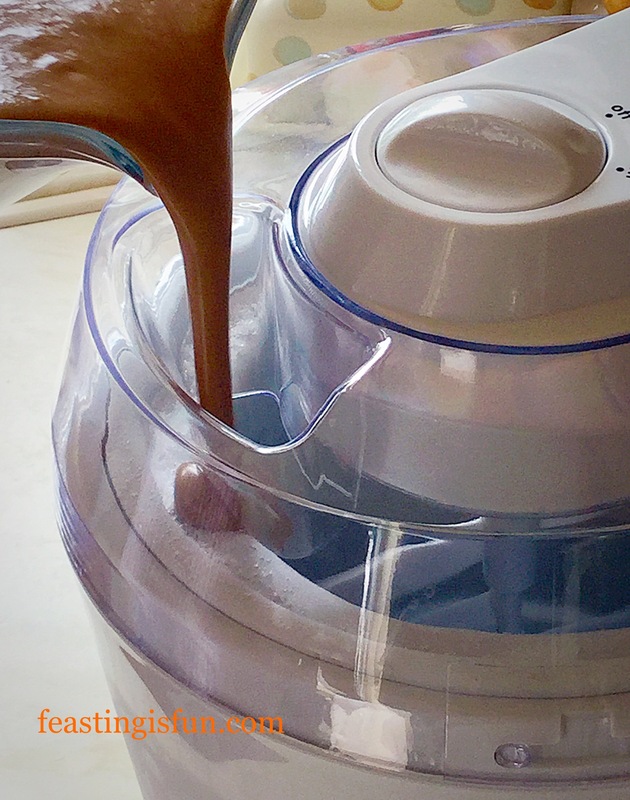 Churning the Chocolate Orange Ice Cream in an ice cream maker ensures that the finished product is silky smooth, the result of smaller ice crystals forming during the churning process. For around £25 it really is a worthwhile investment. 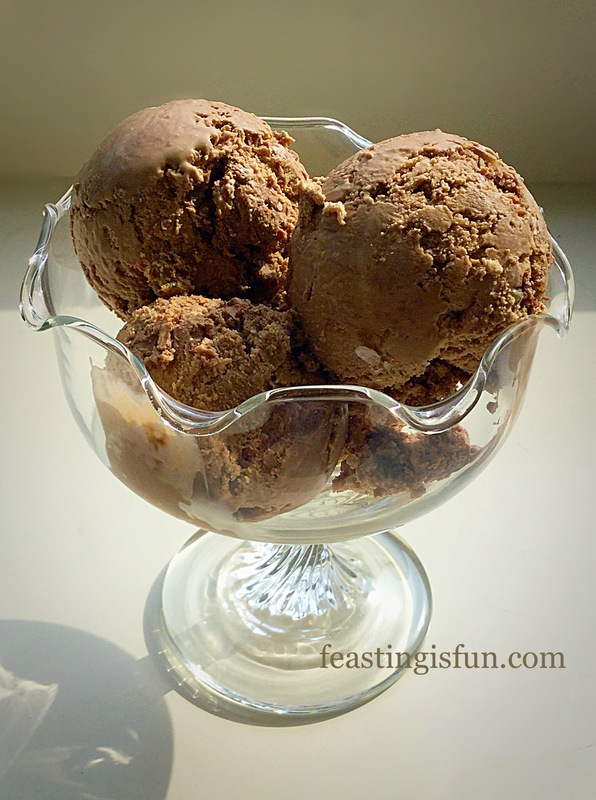 I am thrilled with the Which Best Buy Ice Cream Maker from Andrew James. It’s really straightforward to use & more importantly, from past experience, clean! It’s actually faster at freezing the ice cream than my old model & the freezing bowl takes up very little space in our freezer. If you are looking to purchase an ice cream machine, I thoroughly recommend this one. 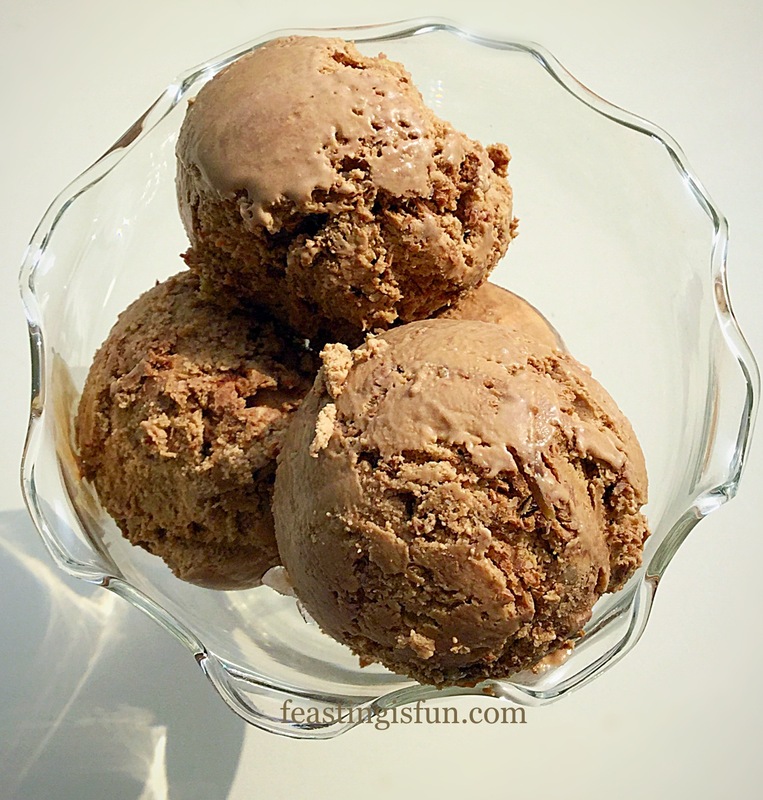 Chocolate Orange Ice Cream elegant enough for entertaining. 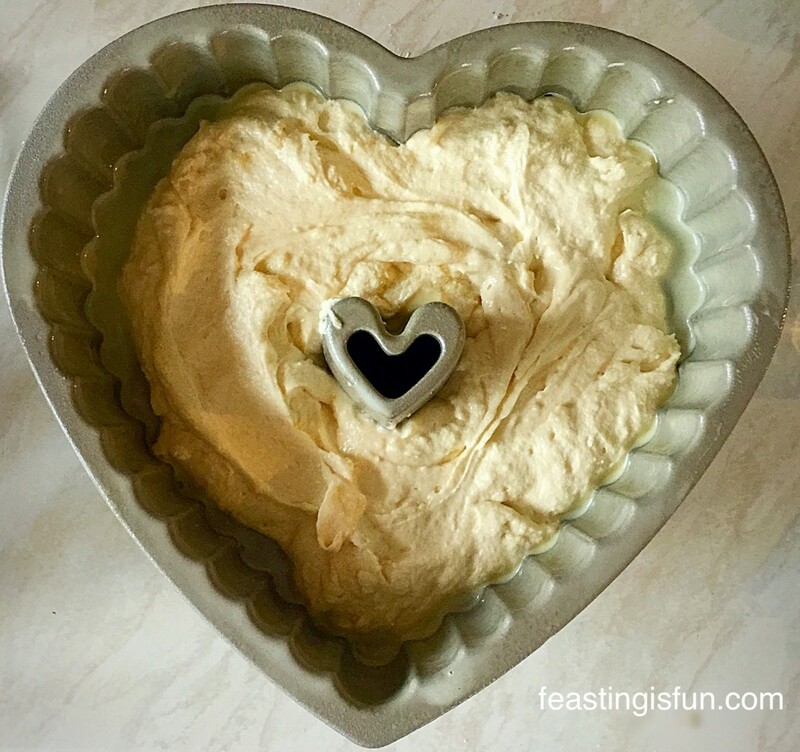 If you wanted to add a splash – tablespoon or two of your favourite orange liquer, the result would be a slightly softer set ice cream that is perfect served in pretty bowls, for dessert, when entertaining. Or alternatively you could reserve the chocolate ganache and pour whilst still warm over the cold Chocolate Orange Ice Cream. 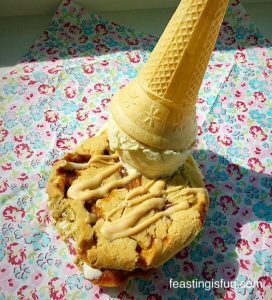 See with homemade ice cream the possibilities really are limitless! Chocolate Orange Ice Cream delicious decadence. 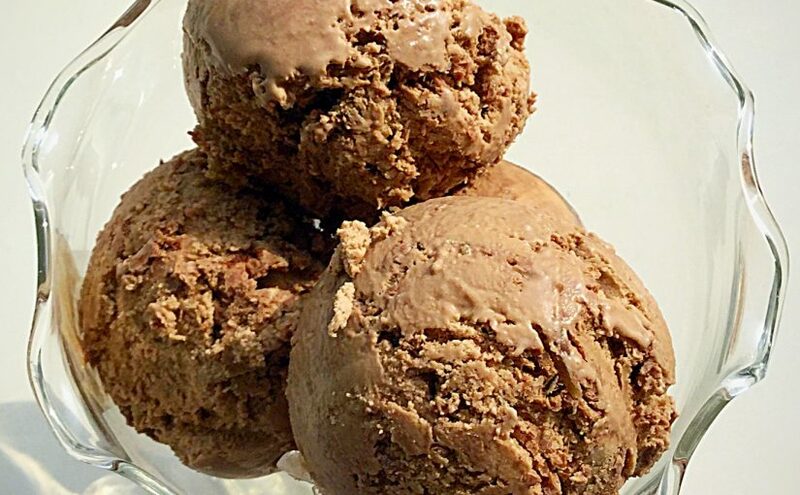 Served in bowls or scooped into cones this Chocolate Orange Ice Cream is sure to be a huge hit with all Chocolate Orange lovers. Method: Place the freezing compartment of your ice cream maker into the freezer 24 hours prior to making this recipe. In a large heavy bottomed saucepan add the milk, 300mls of the double cream and the vanilla extract. Heat on medium until the milk is scalded – it has not yet boiled and little bubbles appear around the rim – remove from the heat at this stage. 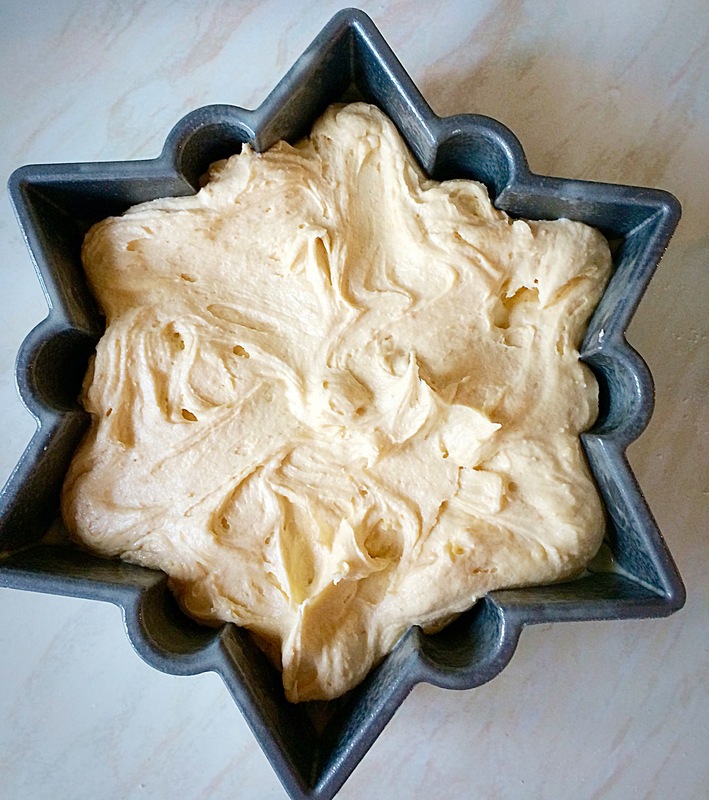 In a large bowl whisk together the egg yolks, flavoured icing sugar and corn flour, until pale and thickened. Once the cream mixture has reached scalding point, with the whisk running on low, pour the hot cream slowly into the egg mixture. Continue whisking until everything is combined. This is now a custard base for the ice cream. Pour the custard base back into the saucepan and heat on low, stirring continuously until the custard has thickened and coats the back of a wooden spoon. Remove the saucepan from the heat and pour the custard, through a sieve into a large bowl. Cover the custard with with cling film to stop the surface forming a skin. 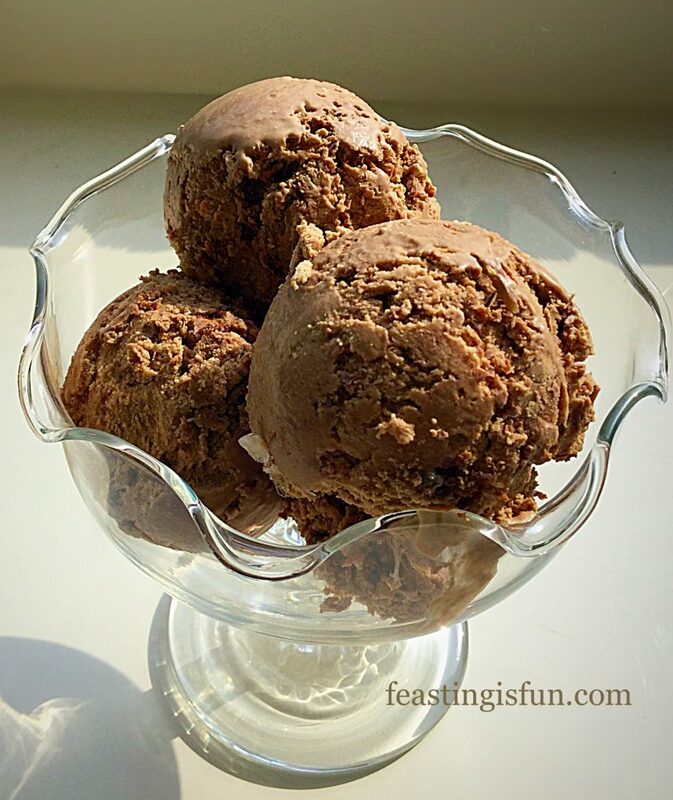 Chocolate Orange Ice Cream made with Jaffa Twist icing sugar. Set the custard to one side to cool and then place in the fridge to chill completely. Set a small saucepan with 5cm/1″ of water on to a medium heat. In a heatproof bowl add 100mls of double cream and the chocolate orange bar, broken into pieces. Place the bowl on top of the saucepan ensuring that the base of the bowl does not come into direct contact with the water – this is called a double boiler. Stir the chocolate and cream continuously until the chocolate has completely melted and mixed in with the cream. Remove the bowl from the saucepan and set to one side to cool. 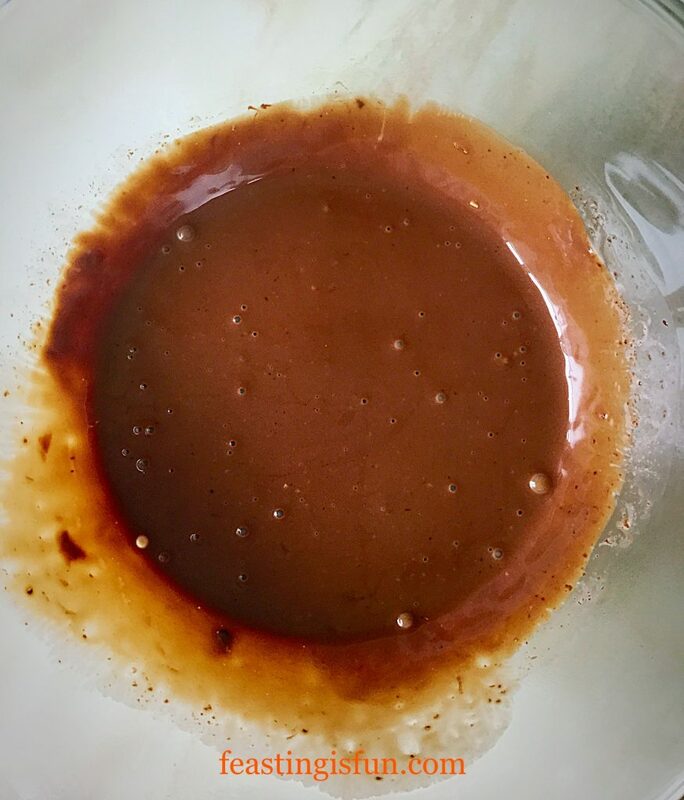 Chocolate orange ganache – the chocolate bar has bits in it which add texture to the finished ice cream. Set your ice cream maker up according to it’s instruction booklet. With the Andrew James Ice Cream Maker, as with my previous model, the machine must be started prior to pouring the custard in – this prevents a thick layer of un-churned ice cream immediately freezing on contact with the freezer container. Transfer the custard to a jug and then, with the mixer stirring pour through the open spout. Pouring the custard through the spout into the churning ice cream maker. 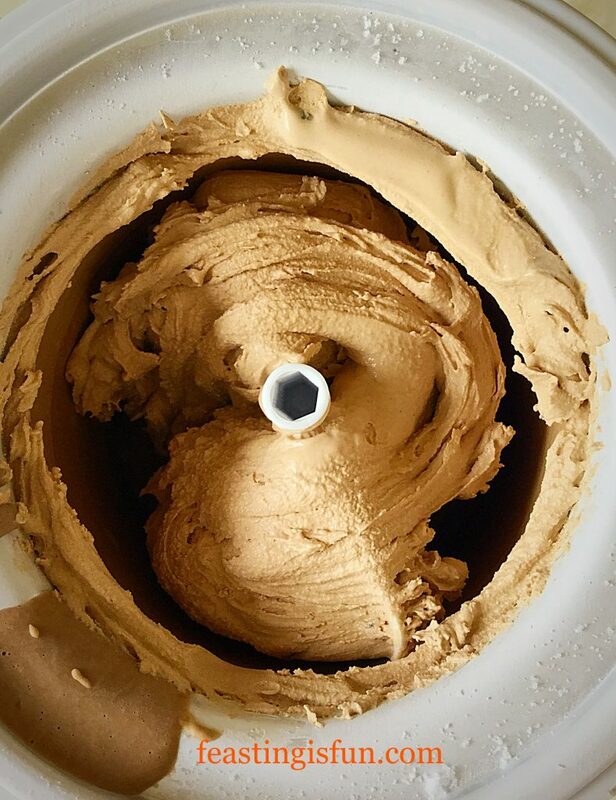 Churn the ice cream until it is a thick, but still slightly soft ice cream. Chocolate Orange Ice Cream ready to be decanted into a freezer container. Turn the power off on the machine and at the plug. Remove the cover and then the paddle, scape as much ice cream off of the churning paddle as you can and then lick the rest off 😉. 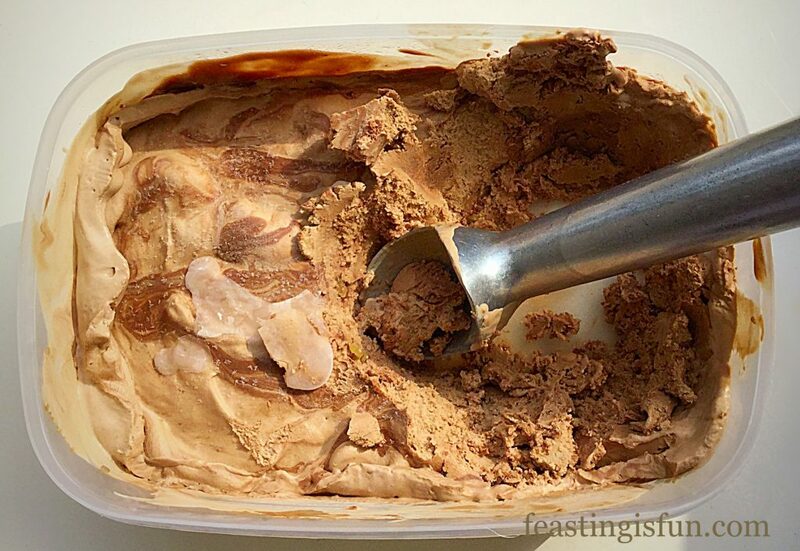 Using a soft silicone spatula transfer the ice cream to a suitable, freezer proof tub. Pour over the cooled chocolate ganache. Chocolate Orange Ice Cream ready to be rippled! Using the handle of a wooden spoon, or indeed the other end of the silicone spatula ripple the ganache through the Chocolate Orange Ice Cream. Pop the lid on, label and place in the freezer to finish freezing. Chocolate Orange Ice Cream smooth and indulgent. Serve scooped into bowls or cones. 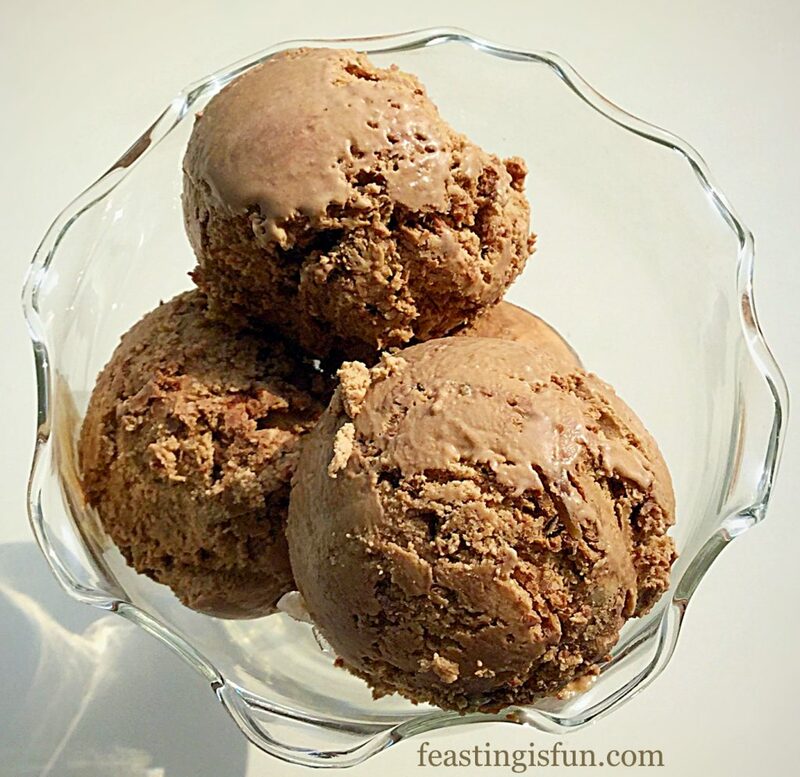 This is one very delicious and creamy ice cream, that should be savoured. If the children are noisy during the summer holidays, give them a scoop full of this Chocolate Orange Ice Cream, not forgetting 2 scoops for yourself and buy yourself 10 minutes peace and quiet. Honestly nobody makes a sound when savouring this delicious treat. Also, being homemade, you know exactly what ingredients have gone into your ice cream. In a consumer society that is increasingly interested in what goes into our food, making ice cream yourself removes any worries. Ice Cream is such a wonderful year round treat, yet during the Summer heat it is also very cooling. 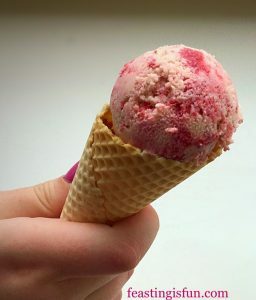 When it is very hot I quite often have just a cone with a couple of scoops of homemade ice cream. Knowing I have used fresh produce, including fruit, I am happy with my choice. I do not and never have believed in ‘good’ and ‘bad’ food. A balanced diet, with a heavy emphasis on homemade food, has ensured that over the years, not withstanding medication, my weight has always been fairly stable. Do you struggle with guilt about food? I know a lot of people do and I am absolutely not here to judge you. Enjoy the sunshine while it lasts, maybe with a delicious homemade ice cream! Andrew James provided me with this ice cream maker for the purposes of a review. All opinions, views, content and photography is my own. Sugar and Crumbs sent me a free sample of their Jaffa Twist Icing Sugar with an order that I paid for. I have not been paid or reimbursed for writing this post, please see my Disclosure Policy. I’m going to let you into a secret, I absolutely love a surprises. Especially when it involves cake. 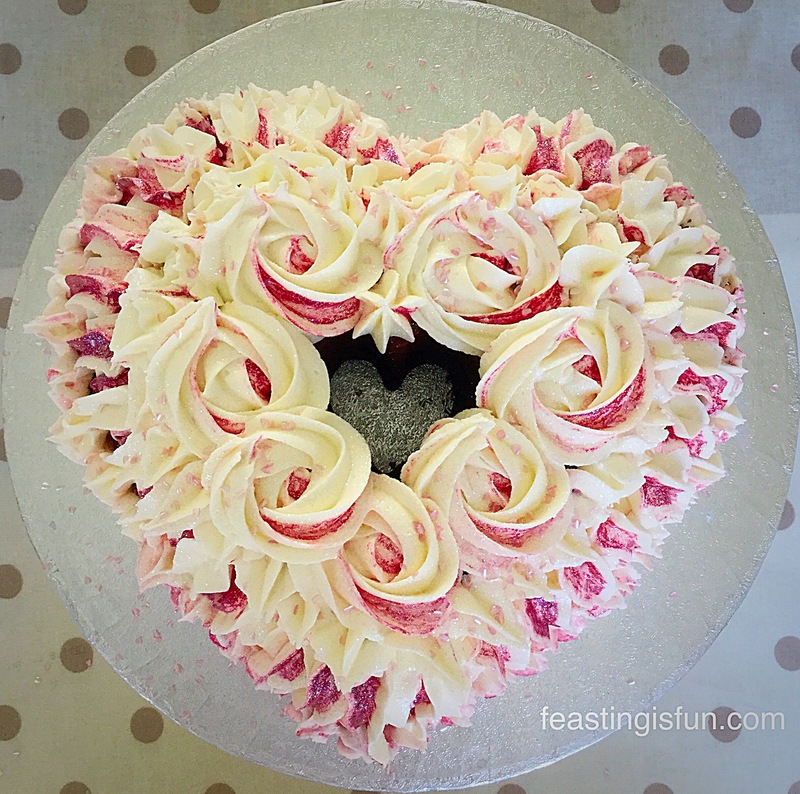 So I made this Heart Engagement Bundt Cake in complete secrecy, for a couple who had recently become engaged. 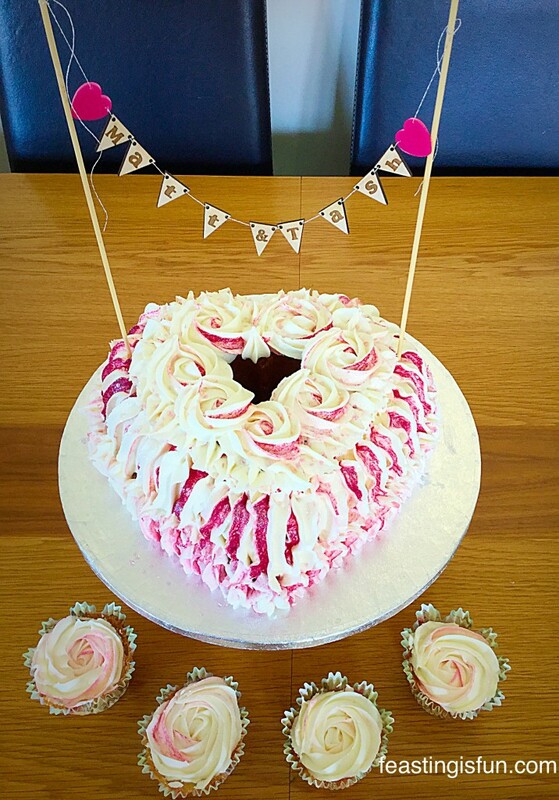 Heart Engagement Bundt Cake set up with the personalised bunting. It was so much fun making this clandestine cake! As the couple had been away, when they got engaged, we wanted to mark the occasion with a small celebration for family and friends. 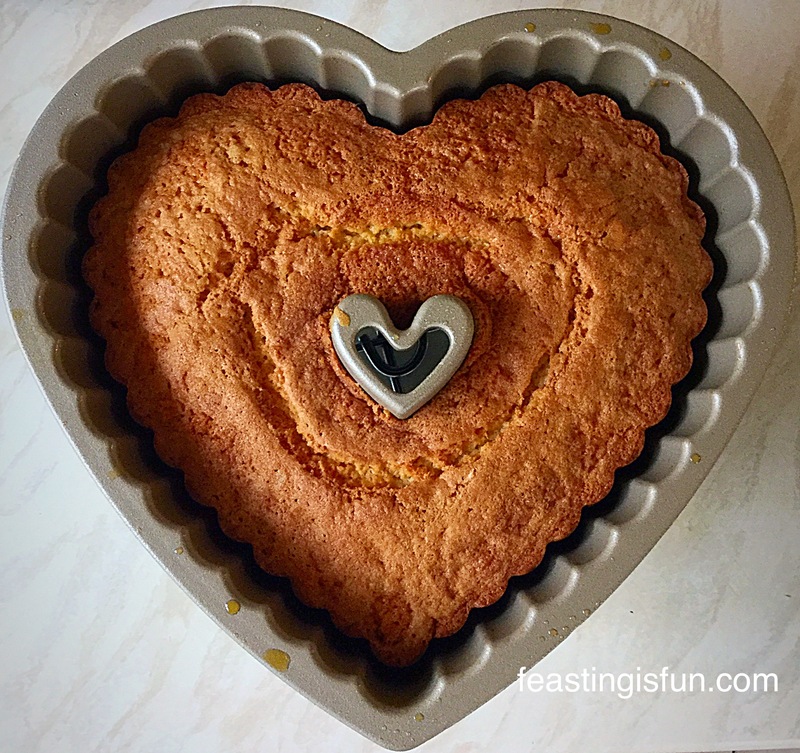 I offered to make the cake as I have a Tiered Heart Bundt Tin by Nordic Ware that I had still not baked with. As I have never made a tiered, or stacked cake, this beautiful cake tin seemed the perfect choice. At the time of deciding to use this tin I had absolutely no idea how I would decorate or ice it. I’m big on planning NOT! Can you tell? Fortunately I have a lovely friend, who I met on Twitter, called Tom. He has his own business Iced Rainbow where he makes absolutely beautiful jewellery. Happily for me, Tom is also a keen baker and creates the most beautiful cake toppers. It really is worth taking a look at his website. After discussion with the parents of the happy couple, I decided to opt for a personalised bunting topper. 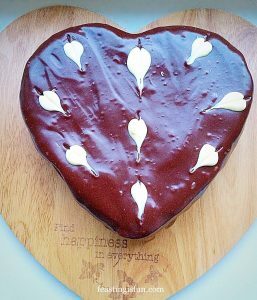 Due to the shape of the cake and the heart shaped hole in the middle, I thought it would not only look pretty, but also add height to the cake. 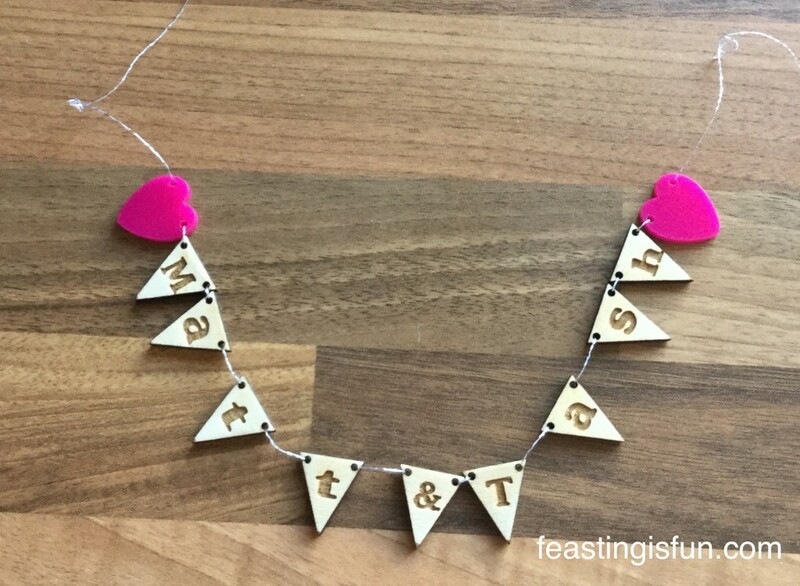 Once the cake is eaten the happy couple have a beautiful, personalised keepsake. Tom was brilliant. He took my vision for how I wanted the bunting to look and turned it into a reality. Thank you Iced Rainbow for making my dreams a reality and for making the bunting at such short notice! Next I had to decide on the flavours. Sugar and Crumbs sell a range of naturally flavoured icing sugars, amongst other baking ingredients and equipment. After much secret discussion, we decided to keep the cake plain, flavoured only with vanilla and use Sugar and Crumbs raspberry ripple flavoured icing. I was very happy as it is one of my personal favourites. I still hadn’t decided how I was going to ice the cake! After having such success with glazing my Lemon Blueberry Bundt Cake I was tempted to do the same with the Heart Engagement Bundt Cake. Using the raspberry ripple icing meant that if I used buttercream I could create the same rippled effect as on these Raspberry Ripple Almond Cupcakes. 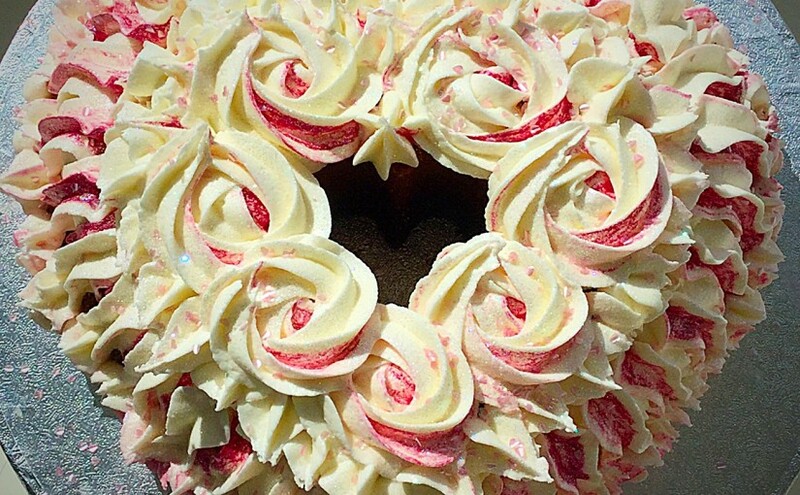 Heart Engagement Bundt Cake the buttercream roses look so pretty swirled on the top. 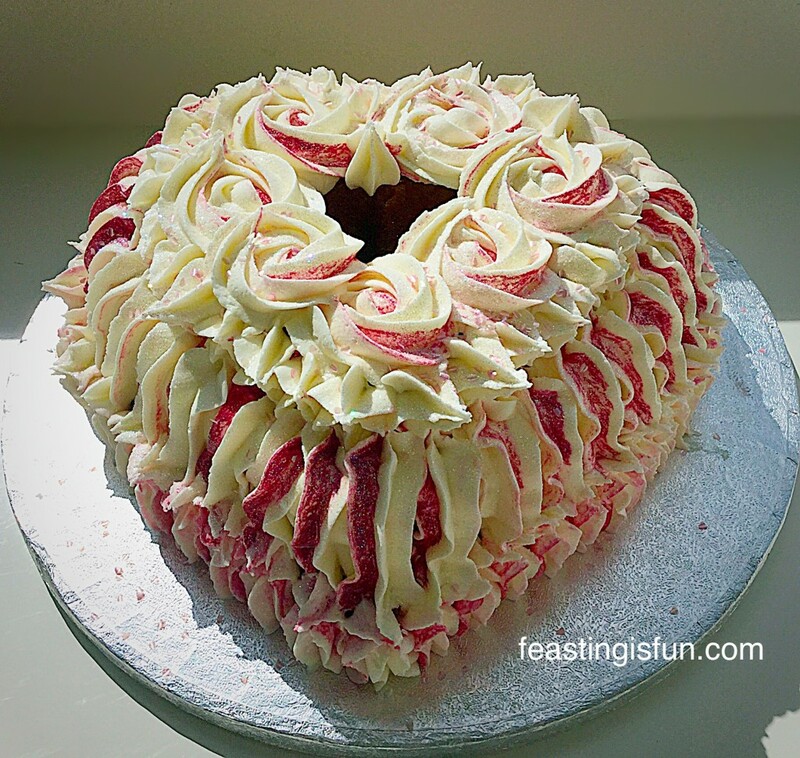 As you can see I decided to pipe raspberry ripple buttercream icing onto the cake. Aside from cupcakes this is only the second time I have fully covered a cake with piped buttercream. It wasn’t as scary as I had imagined! 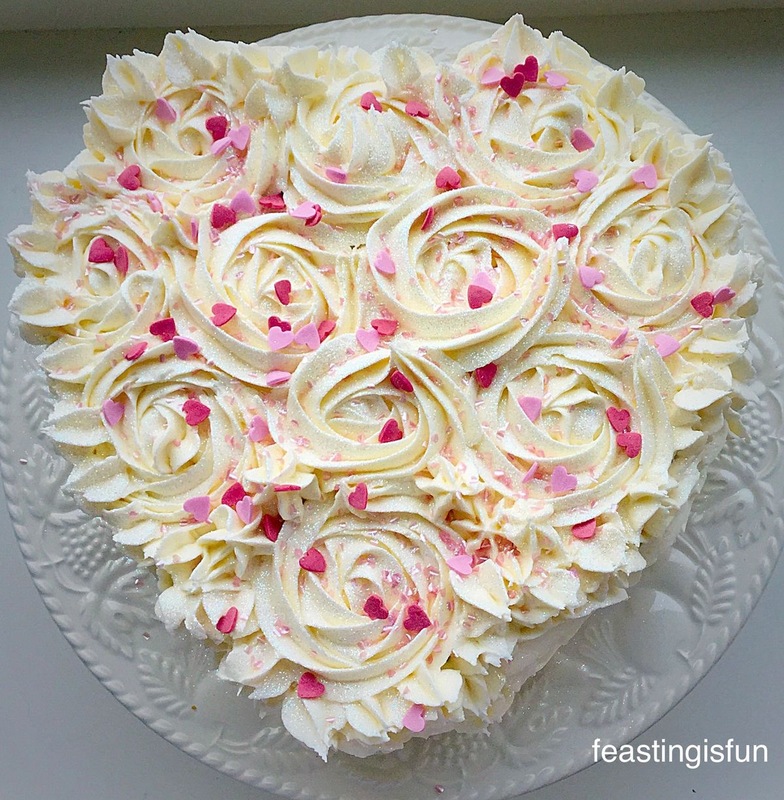 The beauty of buttercream is that, if you do make a mistake, it can fairly easily be removed and piped over. I tell you this from experience 😉. Heart Engagement Bundt Cake here you can see the piping on the sides. When deciding what pattern to pipe onto the cake, I knew I wanted to pipe swirled roses on the top. As for the sides, I really didn’t decide until I had the cake in front of me, piping bag in hand! Once the roses were piped I decided to go with the lines of the cake and piped the second tier in fairly straight lines. 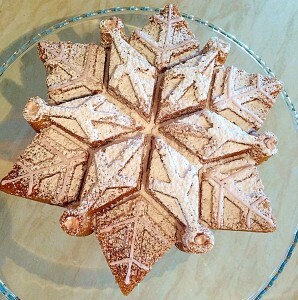 Again I did the same for the bottom tier, although as this was not as deep, it looks like piped stars. I finished the top tier with piped stars to define the heart and fill in any gaps. 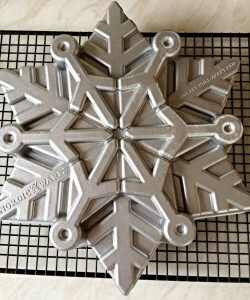 All the piping was carried out using a Wilton #1M large star tip. Heart Engagement Bundt Cake the bunting perfectly sets off this beautiful cake. While it was great having a vision in my head of how the cake could look, once the bunting was in place, the finished version was so much better than I ever could have hoped for. A final sprinkle of tiny, pink, pearlised hearts and white, edible glitter and the Heart Engagement Bundt Cake was ready for the grand reveal. The happy couple, Matt and Tash absolutely loved the surprise. Neither of them had any idea that this little surprise had been planned especially for them. They loved the cake and bunting, which was a huge relief for me! Together they enjoyed cutting the cake, good practice for their upcoming wedding and enjoyed eating it too. I removed the bunting and packaged it back up, for them to keep and treasure forever. When all the cake has gone, they still have their personalised bunting from Tom at Iced Rainbow. Recipe: Makes one Heart Engagement Bundt Cake – serves 20 people. 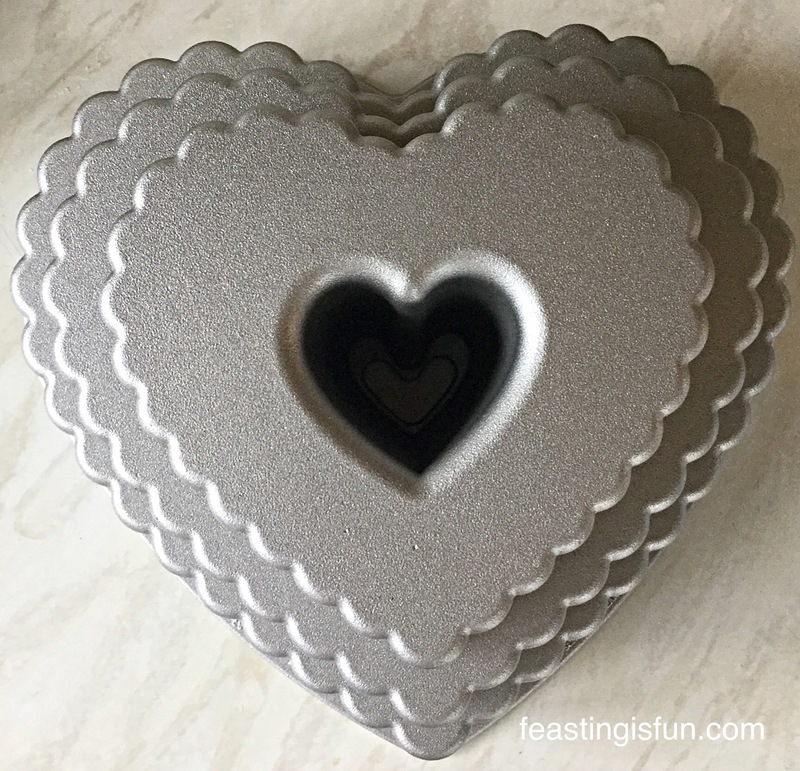 To make this cake you will need the Tiered Heart Bundt Tin made by Nordic Ware. Optional – edible glitter, heart sprinkles. Into a large bowl add the butter and sugar and whisk/beat for 5 minutes until very pale and creamy. Add the vanilla extract and whisk/beat for a further 2 minutes. Sift the flour, baking powder and salt into a separate bowl – dry ingredients. Add one third of your dry ingredients and 2 eggs to your butter/sugar mixture. Whisk/beat until just incorporated. Add the final third of dry ingredients and 2 eggs and mix by hand. Ensuring the bottom of the bowl is scraped, so that all of the ingredients are just combined. Spray your tiered heart Bundt tin with cake release spray, ensuring it covers all areas inside the tin. Spoon the cake mix into the Bundt tin, ensuring the batter is pushed into all parts of the tin, using a spoon. Never fill any Bundt tin more than 3/4 full. Place the Bundt tin into the middle of the preheated oven and cook for approximately an hour. The cake is cooked when it is golden brown, coming away from the sides of the tin and an inserted skewer comes out clean. Once cooked remove the cake from the oven. Allow the cake to cool in the tin for 10 minutes. 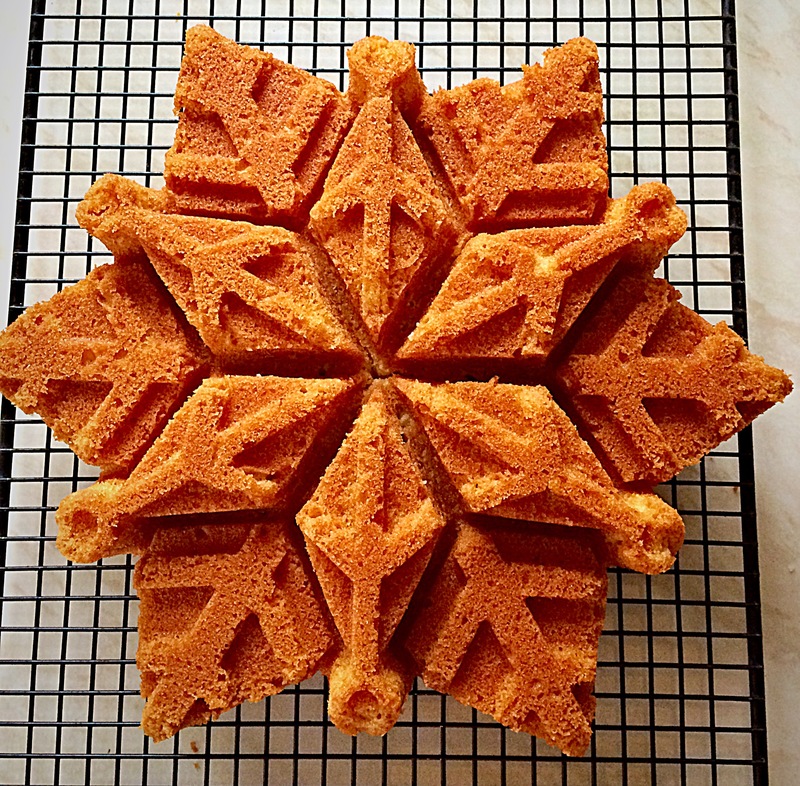 After cooling in the tin for 10 minutes turn the cake out onto a cooling rack. Heart Engagement Bundt Cake – simply stunning. 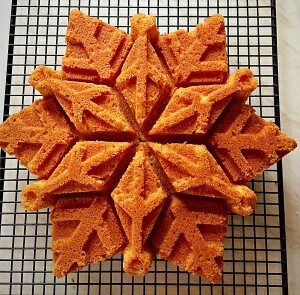 Allow the cake to cool completely before icing. Sift both the flavoured and plain icing sugars into the same bowl. Add 3 tablespoons of very hot water from a kettle. Starting on a low speed whisk all the ingredients together. Add the extra tablespoon of hot water if the buttercream is too stiff. Continue whisking at a higher speed until the buttercream is pale and creamy. Fit a large Wilton #1M star piping nozzle to a large disposable piping bag. Using a small brush, or the blunt end of a wooden skewer dipped into the pink piping gel, paint a line of colour on one side (inside) of the piping bag. You may have to dip the skewer into the gel again to finish the line. Repeat this step on the opposite side. This is what gives the piping the ‘ripple effect’ and works especially well with the raspberry ripple flavoured icing. 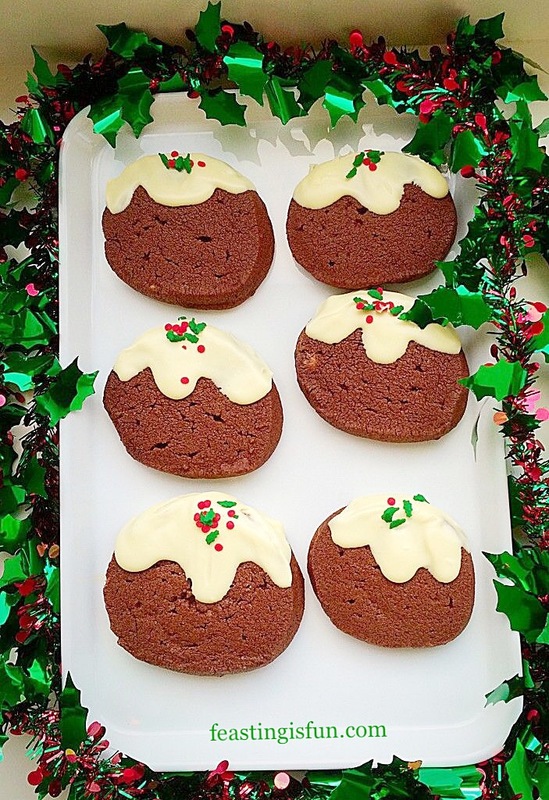 Fill the piping bag with buttercream. 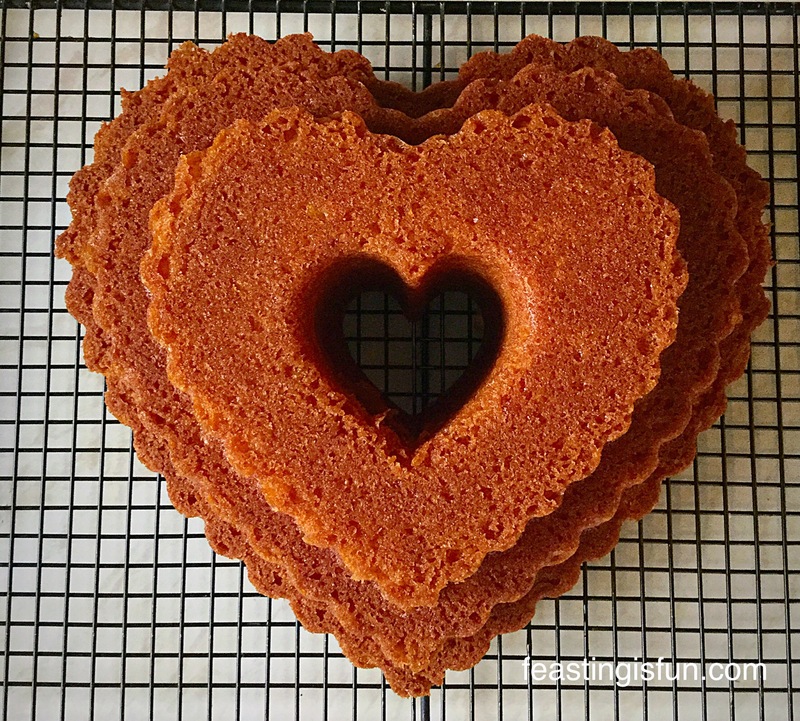 Heart Engagement Bundt Cake – sometimes a picture is better than words. 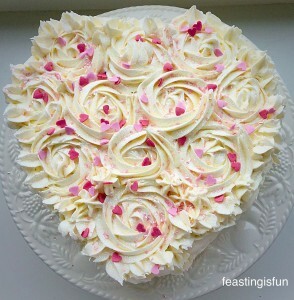 Start by piping a small rose, on top of the cake, either side of the heart dip. Pipe a rose at the bottom point of the heart. Pipe 2 more roses on each side of the heart, so that they very slightly overlap. Next starting from the bottom of the second tier, pipe lines up, to meet the edge of the top tier. Continue all the way round the cake ensuring that a line is piped at the bottom point of the heart. Continue in the same manner for the bottom tier, although I was able just to pipe a large star – as my bottom tier was a little short. The recipe has been adjusted to counter this. Finish by piping a star in between the 2 roses at the top of the heart. 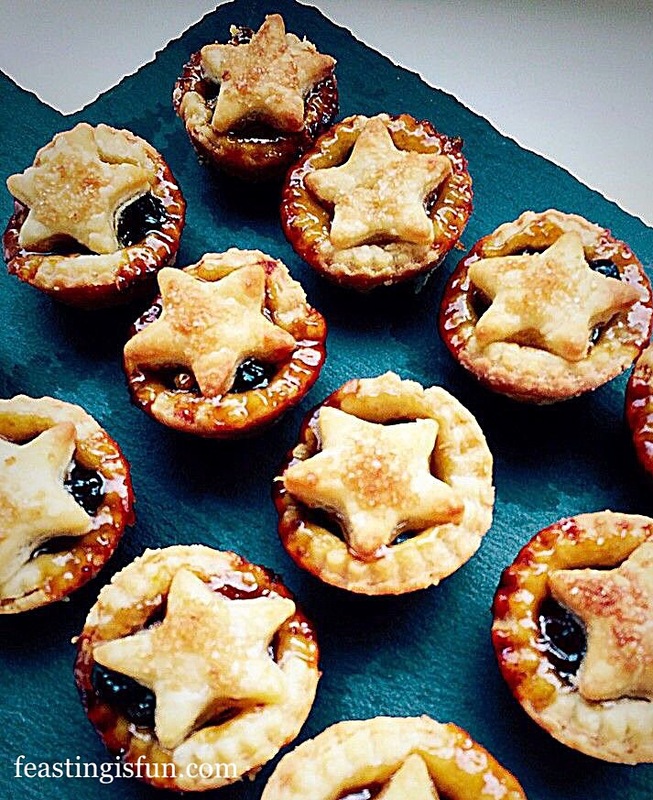 Fill in any gaps around the edge of the top tier with piped stars. Sprinkle over glitter and pearlised hearts. Now stand back and admire the beautifully stunning Heart Engagement Bundt Cake that you have created – ooh and take a gazillion photographs. It was a beautifully sunny day and I took advantage of the glorious light in our porch. It really is so hard to capture how sparkly this cake twinkled in the sunlight. 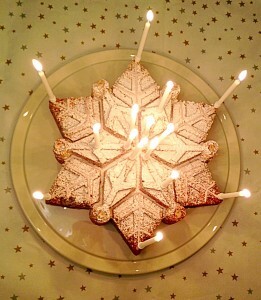 The light danced of off the glittery icing and was mesmerising to look at. 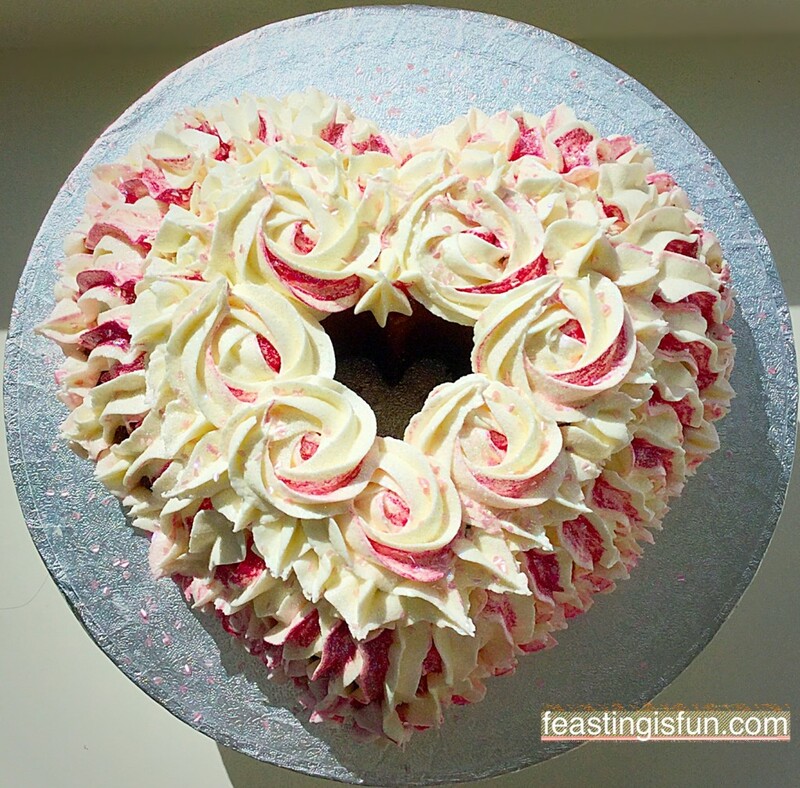 Heart Engagement Bundt Cake beautiful in the spring sunshine. 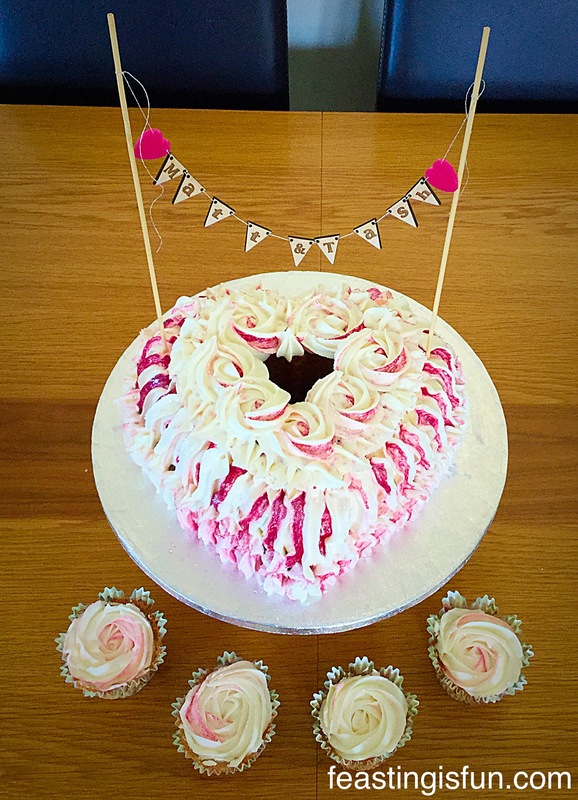 This Heart Engagement Bundt Cake had one very important ingredient that is not listed, love. My husband walked in and saw me smiling as I was writing up this post. When he asked what I was smiling about, I told him that I was remembering the look of love, between Matt and Tash in the photos I have of them. Because I respect their privacy I would not show you here. To me this cake was so much more than Heart Engagement Bundt Cake, it was a symbol of their deep love for each other and our love for the two of them, as a couple, starting their journey of being together forever. This post is dedicated to them. May they have a long, happy, healthy life together and long may they continue to bring happiness to those who are part of their lives. May true love always be celebrated. Baking and decorating this cake was such an enormous pleasure, have you ever made a cake, or something else, that made you smile? 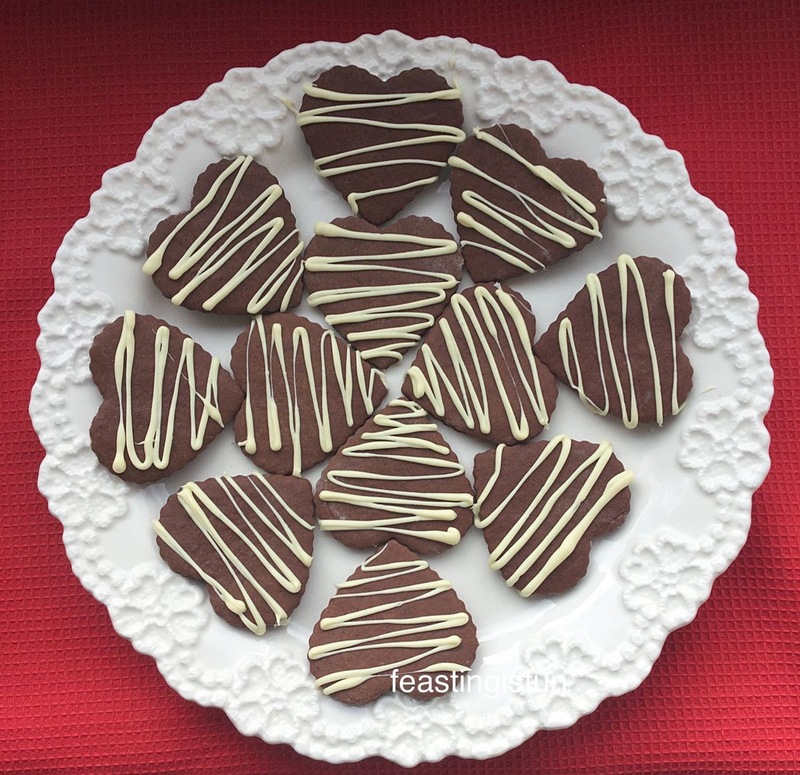 Chocolate Heart Cookies made for my family for Valentine’s Day this year. I am so pleased that Matt and Tash gave me permission to share this cake with you. Also I hope you have enjoyed this post? I love seeing what cooking and baking you get up to. If you are on Twitter or Instagram please pop a photo up and I’ll be sure to give you a shout out or retweet. Are you a romantic like me? Merry Christmas one and all. 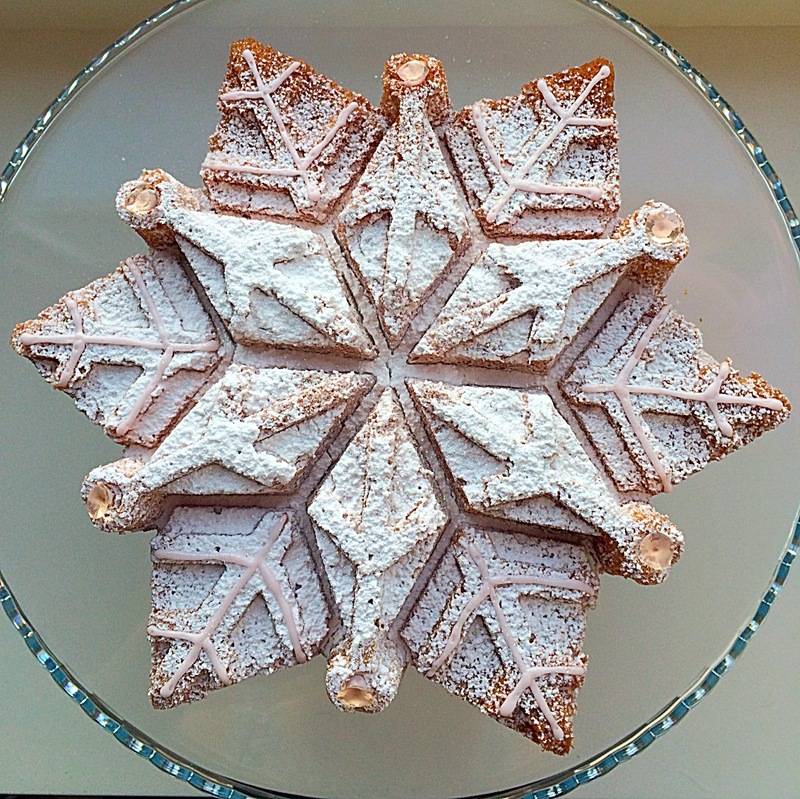 Today I am sharing this beautiful Sparkling Snowflake Cake with you. 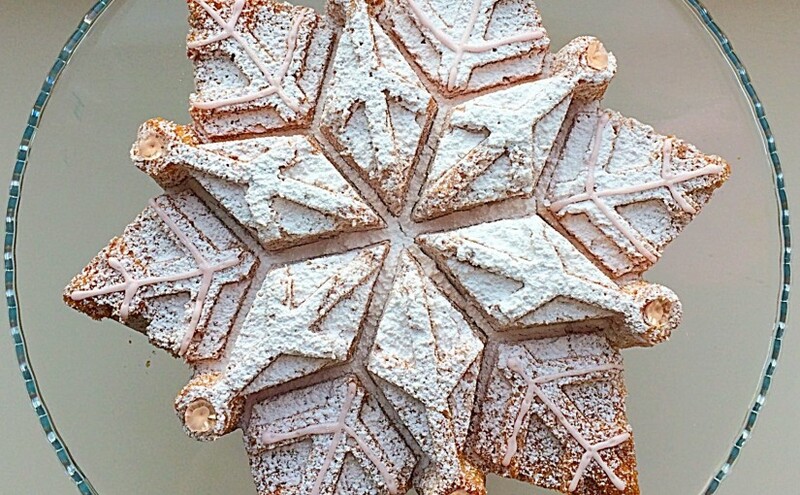 This Sparkling Snowflake Cake is stunning and I can take no credit for the beautiful detail. 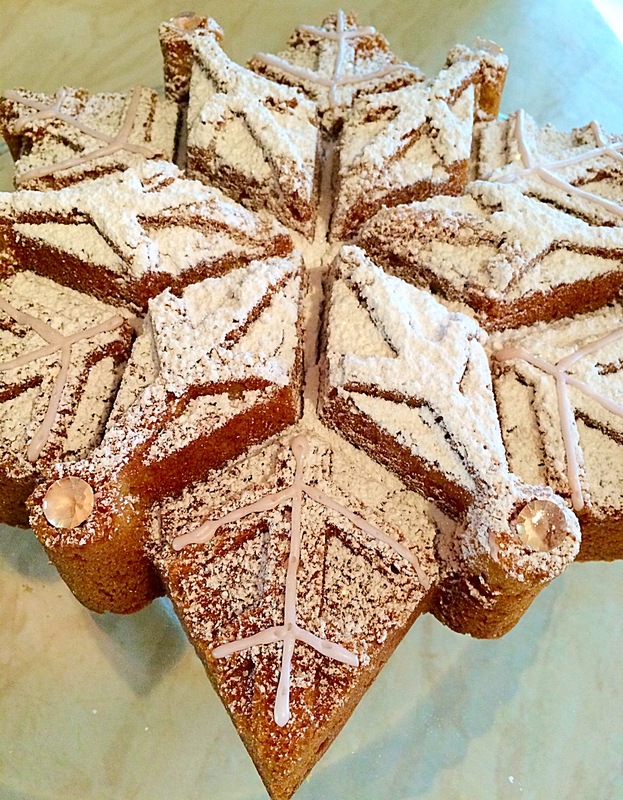 Because the cake is baked in a beautiful Bundt tin made by Nordicware . Amazon, ebay and Lakeland UK are all stockists of Bundt tins, it really is worth shopping around as prices vary. Although Bundt tins are not cheap, treated with care and looked after they will last a life time. 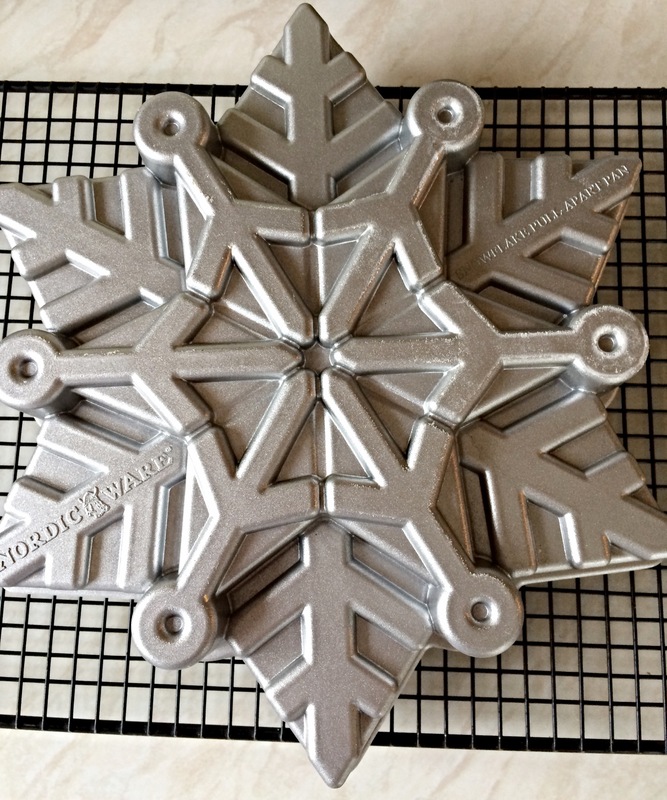 Another beauty of Bundt pans is the beautiful array of delightful shapes available. Although I embellished this Sparkling Snowflake Cake with edible diamonds, a dusting of edible glitter and some piped icing, a dusting of icing sugar would be perfect on it’s own. Our youngest daughter should have been a near Christmas baby, however, she obligingly arrived early! 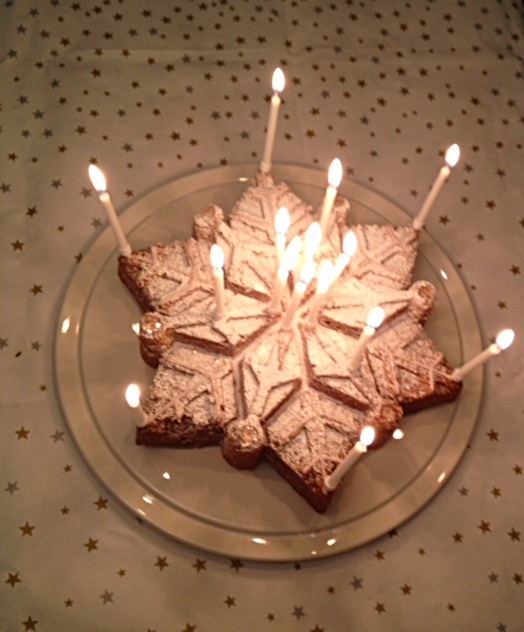 So this Sparkling Snowflake Cake was made for her birthday. Because she isn’t too keen on icing this cake was perfect for her. 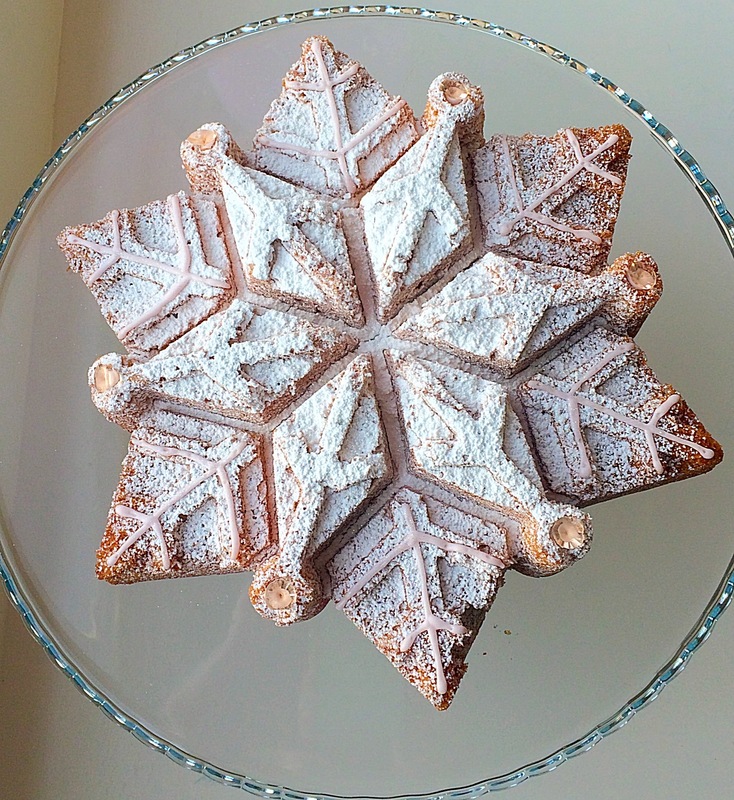 A deliciously moist vanilla sponge, dusted with flavoured icing sugar. The flavour I used is called Santa’s Snowball, perfect for this beautiful snowflake. Since I had some edible diamonds if knew they would look perfect on this cake. White, edible, sparkly glitter was also dusted on top of the icing sugar. It is a real shame that it didn’t photograph well, in any light, trust me I tried. Moving the cake aound the house to catch the small amount of sunlight that we get this time of year, shining through the windows. The lengths I will go to trying to get the perfect shot! 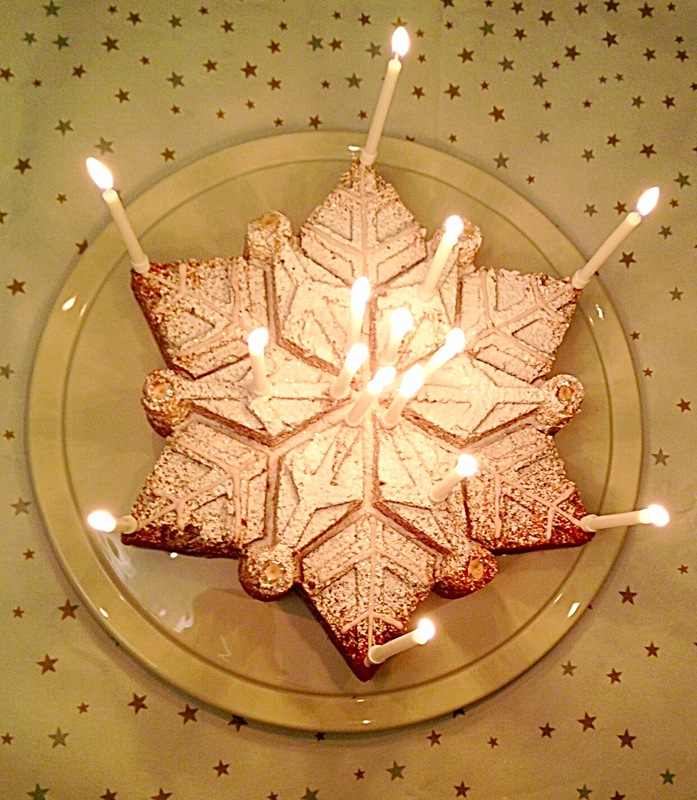 You will just have to trust in me that this cake really, really sparkles. It looks so pretty, twinkling like a real snowflake. 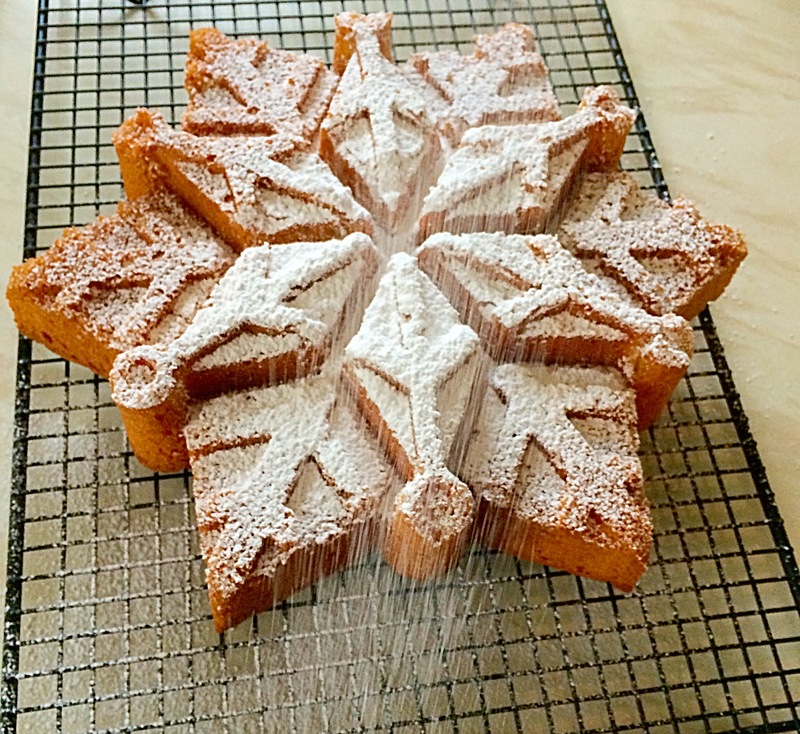 Although we may not get snow this Christmas, we can certainly make your own! 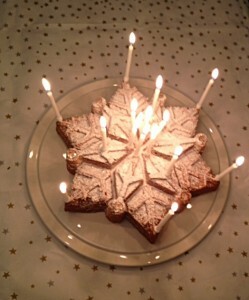 Here is the Sparkling Snowflake Cake lit by candles for our daughter’s special day. 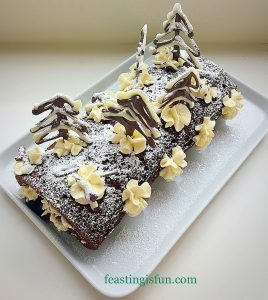 Certainly it would make a fantastic alternative to the traditional, fruit laden Christmas Cake. Set on a cake stand, or pretty plate, surrounded by tea light candles which add extra sparkle. Resulting in a glittering, festive feast. 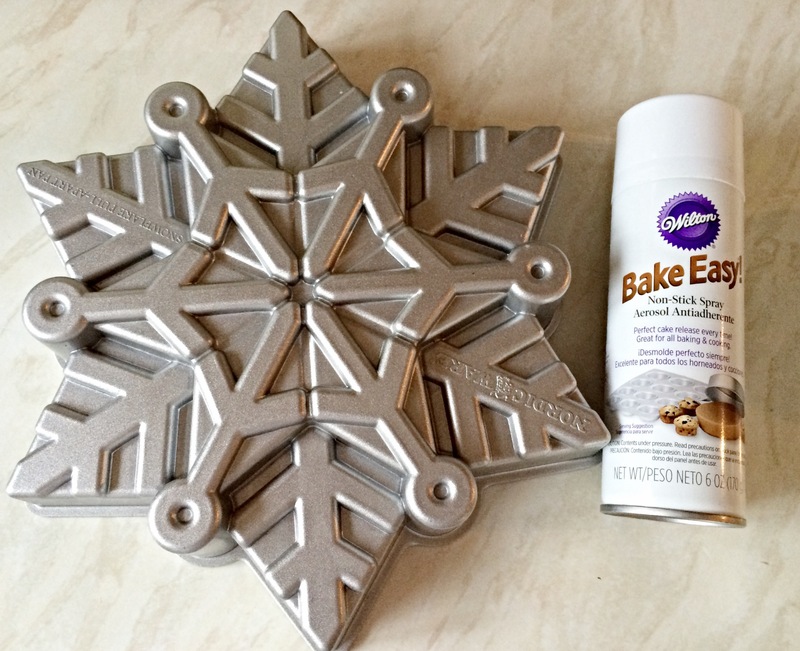 Here is the incredibly detailed snowflake Bundt tin that I used for this cake, alongside is Wilton bake easy, cake release spray. I cannot emphasise enough how important it is to use cake release spray (or the brush on version) for this tin. I tried this recipe, brushing the tin with melted butter, as I have with previous Bundt bakes and the cake stuck. Badly. It was an epic disaster. I even cried – how silly is that? Finally, determined not to be beaten by a cake tin AND with lots of tips and advice from my Bundt baker friends on Twitter, I rebaked the cake and SUCCESS. 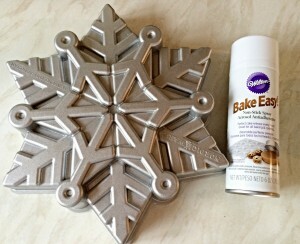 Snowflake Bundt tin and cake release spray. Now time to share how I made this wonder. Optional – Edible glitter in the colour of your choice and edible diamonds. Both available from cake decorating shops and Amazon. First of all thoroughly spray or brush the Bundt tin with cake release. I will not judge if you want to give it a double coating (I did!). Cream the butter and sugar together in a large bowl until light and fluffy. Add the salt, vanilla extract, one third of the flour and 2 eggs. Mix until just incorporated. Next add another third of flour and the last 2 eggs and mix as before. Finally add the remaining flour and gently mix into the cake batter until incorporated, taking care not to over mix. Spoon the cake batter into the prepared Bundt tin ensuring it is evenly spread into all the points. Place the tin in the oven and bake for 30-35 minutes. The cake is cooked when pressed lightly in the center and it springs back, or an inserted skewer comes out clean. 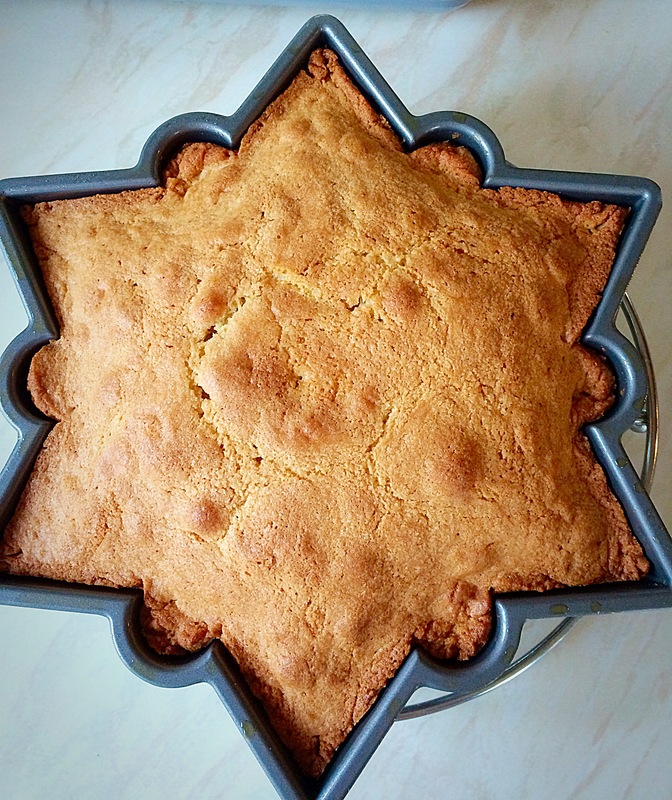 As soon as the cake is baked remove from the oven and place the tin on a cooling rack or trivet. Leave the cake to cool in the tin for 10 minutes. Invert the Bundt tin on to a cooling rack. Leave for a further 5 minutes. If the cake doesn’t turn out immediately gently tap the tin and the cake should release. If the cake still will not turn out, gently go around the ouside of the cake with a small palette knife. Re-invert the tin on to a cooling rack, the cake should release easily. Note: Importantly, the more you use a Bundt tin the more non stick it becomes. 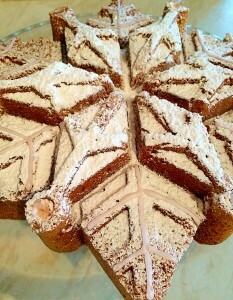 Sparkling Snowflake Cake look at the beautiful detail. Dust the cake liberally with icing sugar. I made a small batch of royal icing, lightly tinted pink and piped detail on to the outer points. Edible diamonds were placed in the round dips, as seen in the photo below. My Sparkling Snowflake Cake is as beautiful as it is delicious. It would make the perfect gift as would the tin. A great tip if you know someone who enjoys baking. Store the cooledcake in an airtight container and eat within 5 days. During the festive season I especially enjoy baking. Rather than relying on shop bought, prepared food (although they have their place), spending time in the kitchen relaxes me. While listening to Christmas carols I am lost in a world of delicious aromas and sparkles. Since it is the season of goodwill, making cookies and mince pies are a great gift for sharing with family, friends and neighbours. Above all it is a time to give thanks for the baby Jesus.